The word NUDGES is an acronym for the categories of nudging, and we are breaking those down episode by episode over the next six weeks to showcase different aspects of choice architecture and nudging. Today, we are starting with the N of nudges…which is for innnnnnncentives. [03:21] You are a choice architect if you present options to people and indirectly influence their choices – this is everything from where you place food in the line in the cafeteria to an opt in form on a website to doctors presenting treatment options. [04:23] A nudge is something that helps someone make a choice. This is everything from the order things are on a list of choices to the wording used to them, and yes, incentives. [04:51] Supply and demand fluctuate in predictable ways and are like two opposing forces in an intricate dance. [05:12] Proper incentives can help to encourage sales when you understand how they work. [05:14] The tricky thing about incentives is that they are never one sided and our lazy brains don’t tend to think about all the proper aspects of the choice presented. [05:51] Good choice architects understand how to structure the nudges and architecture to do what is best for their business. 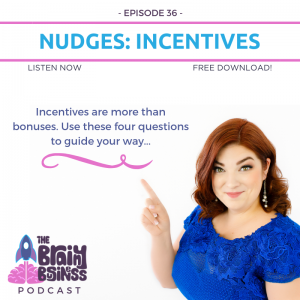 [06:02] Ask these questions to figure out what all the incentives are and how they work together: Who uses? Who chooses? Who pays? Who profits? [07:17] I am going to use the example of air conditioning as a constant throughout the series. [08:36] My husband and I bought a house that didn’t have air conditioning installed. The builder gave us the option of adding air conditioning whenever we wanted. We decided to test out a Seattle summer and see if it was really needed. [09:08] After one super hot summer, we decided to get the air conditioning. [09:19] We had someone come to the house and do the evaluation for air conditioning. I learned the standard formula based on the square footage of the house, the number of vents, etc. [09:52] You think the choice is, “Do you want air conditioning or not?” Yes or no. Of course…it’s not really that simple, which is why this air conditioning example will be featured throughout the series. [10:28] For the air conditioning example, the person who uses is me/my husband. [11:31] When cooling our home, we actually have many options such as using fans, staying in hotels, or filling our bathtubs with ice. There are also multiple companies to choose from once we decide we want air conditioning. [12:16] Who pays is my husband and I (note, payment is not always monetary). [12:45] The company that sells the air conditioning units (and their employee making the sale) are the ones who profit (as well as their manufacturers). There are different levels of profit. [13:57] I know there is markup on the items and I am paying for the convenience of not having to invent and build air conditioning. [14:42] What happens when there are conflicting incentives? [15:57] After we agreed to purchase the air conditioning, we were asked if we wanted a wifi enabled unit. [16:31] Wifi enabled allows you to adjust the temperature using your phone. [17:55] It’s also the same price as the unit without wifi. This got me thinking about what I would advise this company if they were a client of mine. [18:07] Why is it the same cost to the consumer? And why wasn’t that choice communicated better? Where was the nudge? [19:44] This happens all the time because of conflicting incentives. [19:53] The advice I would give this company is to align the incentives to find the win-win-win scenario. [21:13] If it was necessary to increase the price for the wifi enabled model, it should be the default option (the price you start with) and then let the person take away wifi if they don’t want it. This is your choice architecture. [21:37] Now the question becomes, “Do you want the wifi enabled unit or not?” versus “Do you want AC or not?” This simple nudge and shift in the architecture completely changes the question in the mind of the consumer (for a way that is favorable for the business). [22:18] Sometimes as a company, you need to take a step back to understand what is worth paying for. [24:18] Salience, or saying something is salient, is the way an item “stands out” from other items. [24:44] The consequences of a choice are salient means that the chooser is aware of the consequences of each choice. [25:06] It’s important to always ask and try to understand if the person making the choice is aware of all the incentives, consequences, and dynamics of that choice. [27:08] How can you make the choice and its repercussions more salient for the chooser? [30:07] It’s an easier choice to make when things are broken down in a way that your brain can understand. [30:30] Being in sales is being a full-time choice architect. [30:41] Understanding all the incentives involved and how they interact with each other can help ensure the choice that is best for everyone gets nudged. [31:12] An example of incentives and salience when buying a car. [33:43] The way a choice feels can impact the choice a human makes. [34:43] Think about what you want to bring your customers attention to. Examples for gyms, soda, television and more. [40:28] Surge pricing and energy usage. This may teach people to use less energy, but it’s not as salient as it could be. [42:58] US Healthcare example. The way the information is presented affects the choice, and it may be too complex for anyone to choose correctly (stay tuned for this to come up again in our episode on structuring complex choices – the S in nudges). [46:42] Think about your own business and what you are selling to your customers – whether it is a product or a service. What do they need to know and have salient to make a good choice? Episode 8. What is Value?